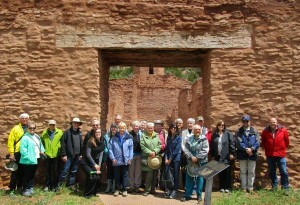 Members of the Palace Guard pose for a picture during their 2015 visit to Jemez Historic Site. The Palace Guard serves as the “friends” group for the New Mexico History Museum and Palace of the Governors. Participants pay for a higher level of membership within the Museum of New Mexico Foundation, which helps support educational programs and other essentials. In return, members gain access to backstage tours and field trips to broaden their grasp of the art, culture and history of the Southwest. This year, the Palace Guard’s volunteer steering committee, under the chairmanship of Michael Ettema, took the lead in plotting out a variety of trips and programs. The trips draw on collaborations the museum staff is building with entities like the Georgia O’Keeffe Museum, the Heard Museum, and Allan Affeldt, owner and renovator of La Posada Hotel in Winslow, AZ, and the Castañeda Hotel in Las Vegas, NM. Visit Dr. William Itoh’s home to see his collection of Civil War material, enjoy lunch at Los Poblanos and a tour of its John Gaw Meem–designed buildings, peek into the Center for Southwest Research’s collections, and tour UNM’s Zimmerman Library with John Gaw Meem Curator Audra Bellmore. Spend the night at Mary Jane Colter’s favorite Harvey House, La Posada in Winslow, with a talk by Curator Meredith Davidson. At the Heard Museum in Phoenix, Curators Diana Pardue and Kathleen Howard give an exclusive tour of Over the Edge: Fred Harvey at the Grand Canyon and in the Great Southwest. Visit two Frank Lloyd Wright properties, including a private home, sample the Scottsdale art scene, and relax at the classically cool Valley Ho, a mid-century modern gem. The owner of luxurious cars opens his private collection just to us. After a lunch with Curator Daniel Kosharek, we’ll conclude the day talking with Sonnie Jaramillo at his private shop, where we will see examples of lowrider and custom-car work in action. We’re moving our annual event to the home of Museum Director Andrew Wulf for cocktails and catered appetizers. Museum curators share their favorite stories and artifacts, while you learn what goes on behind-the-scenes of our museum. Join us as we toast your support and membership. Free for Palace Guard members. Ysleta, Socorro, and San Elizario southeast of El Paso played important roles in the history of New Mexico. Refugees from the Pueblo Revolt settled Ysleta and Socorro; San Elizario was an early presidio. In 1877, a bloody battle erupted over access to nearby salt lakes. Visit historic churches and the Salt War site with a local expert. This exclusive visit to Ghost Ranch includes a tour of Georgia O’Keeffe’s usually closed home. Stay at the Presbyterian Retreat Center, with an additional tour of Ghost Ranch and a dinner talk by author Lesley Poling-Kempes. Enjoy the autumn air and night sky in the surroundings that inspired New Mexico’s most famous artist. Space is limited; book early. Does your home hold unknown treasures? Bring up to two antiques, artworks, Native artifacts, books, documents, or collectibles to our panel of expert appraisers. This event is open to the public, and appraisal fees of $25 per item or $45 for two will support museum exhibits and programs. Membership in the Palace Guard starts at $75, and most events carry additional costs to cover expenses. The events feature a mix of carpools and buses. Call Alex Hesbrook for details on each, including cost, at (505) 982-6366, ext. 119.